Super moist, homemade Banana Bread that is simple to make and perfect for spreading some delicious Nutella on top of each slice that will bring a smile to everyone’s face at breakfast! Yesterday, my mom came to visit me to go shopping for shoes for some upcoming weddings I am in this summer.Tis’ the season for weddings! Before my mom arrived, I woke up early to bake my moms favorite quick bread, Banana Bread. It’s my grandma’s recipe and it’s been in the family forever, my grandma still makes a loaf or two for everyone for Christmas. It seriously is the best gift EVER! 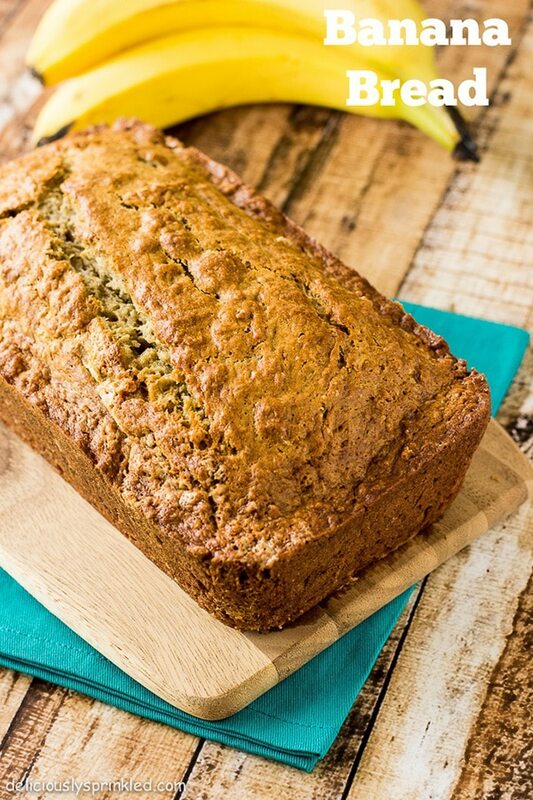 And this banana bread recipe is one of the first recipes my mom taught me how to make when I was learning to bake as a little girl, as I grew up I loved baking so much that I took over all the baking in our house. Which is the reason, I have a passion for baking today. It makes me the most happiest, and luckiest girl to do what I love as a food blogger, sharing my love and passion for baking with all of YOU! ✔ Don’t let the top of your bread BURN! About half way through baking this bread, make sure to check to see if the top of the bread is getting too brown and if it is just place a piece of aluminum foil over top of bread for the rest of the baking time to avoid burning the top of the bread. ✔ Want to know the trick to get the big, fluffy top!? Well, it’s easy, all I do is bake the banana bread at 375F for 15 minutes, then I REDUCE the heat to 350F and bake for an additional 40-45 minutes. I let the bread cool before removing from loaf pan. ✔ Lastly, this banana bread freezes very well. You can freeze this bread up to 3 months. When your ready to enjoy let thaw completely, and cut into slices. PRE-STEP: Preheat oven to 375F degrees. Spray a 9x5 loaf pan with nonstick spray. Set aside. STEP 5: Pour banana bread mixture into prepared loaf pan and bake at 375F for 15 minutes. REDUCE heat to 350F and bake for an additional 40-45 minutes until edges are slightly brown or until toothpick inserted into center comes out clean. STEP 6: Let cool completely before removing from loaf pan. Once cooled, spread some Nutella on a slice of the banana bread before serving. 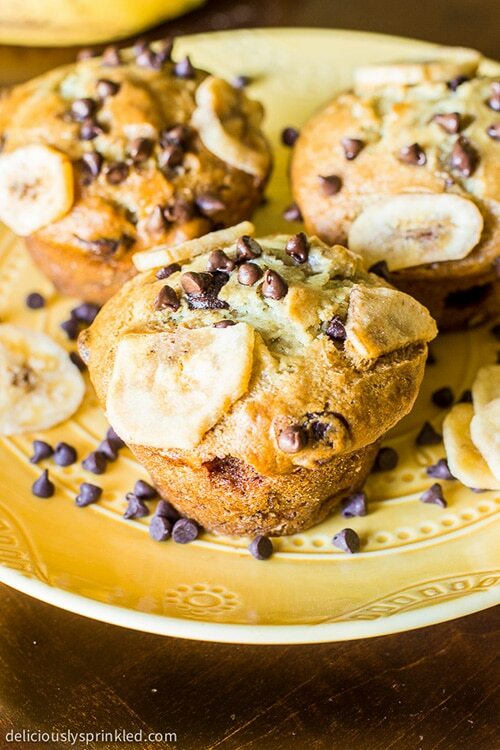 And try these delicious Chocolate Chip Banana Muffins next! 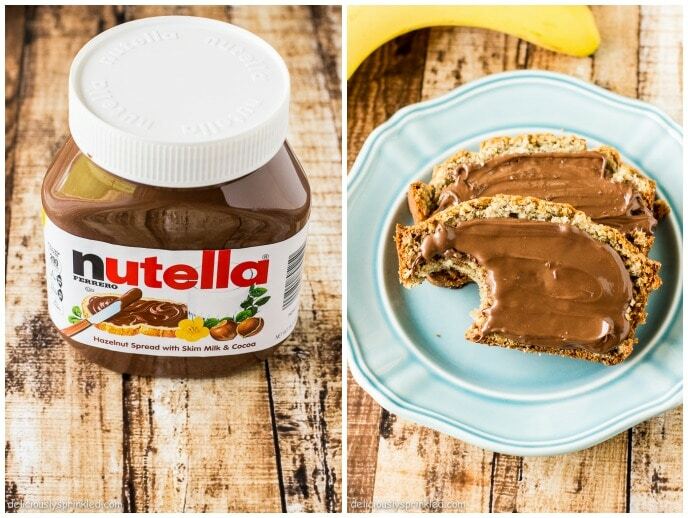 I don’t know why I have never thought to spread Nutella on banana bread — that’s genius!! A nice homage to your early days in the kitchen w/ your mama! Can’t get any easier than this and a definite yes for the spread of nutella. My banana bread never quite makes it to the oven. The reason? It is my favorite batter! Oh man, I LOVE banana bread! Yours looks delicious! Banana and Nutella = that’s life! Oh man! I LOVE Nutella and this bread looks great. A flavor combination that just had to happen! What a great idea to put Nutella on Banana Bread! I love it! Banana bread is my favorite but with a big schmear of Nutella? Heck yes! 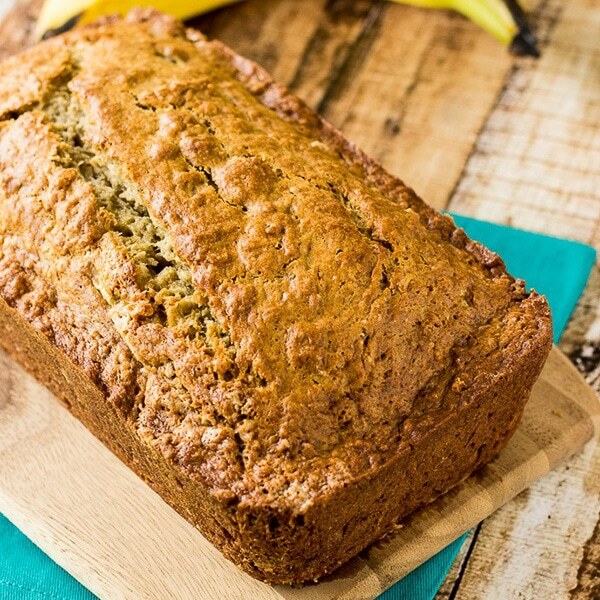 I love banana bread, this looks delicious! We just had a discussion of things we like to put Nutella on here and banana bread was not even thought of! I almost always have banana bread around, can’t wait to try this. You banana bread looks so good! I might even put cashew butter on it! Homemade banana bread is always a hit in my house too! I can’t remember the last time I actually ate a banana just by itself – they always turn before I get to them. Banana bread is the best invention ever. And with Nutella? Even better! I love banana bread! Top it with Nutella – even better!! Chocolate and bananas – one of my favorite flavor combinations. What a beautiful way to start the day! Why didn’t I think of this, so great Jenn!! My boys would love this.